Whalan Reserve, a recreation area beside and east of Ropes Creek and close to the main western railway line, has an interesting story to tell. It's within the Blacktown City Council local government area, in close proximity to Mt Druitt (close to the east) and Penrith (further west). Of course it has a long indigenous history with some archaeological evidence found of camping by Darug people in several locations in the area, but sadly - to my knowledge - there has been little investigation into that aspect of the landuse. It also housed an airstrip during WWII, after which time it was recycled to become Mt Druitt's once famous - but sadly almost forgotten - motor sport track with meetings regularly organised by the still extant Australian Racing Drivers Club. The site itself was used by the RAAF during World War II as a "dispersal field", one of many in the Sydney area. It was also used for training, repair and salvage units. The first RAAF guard dog unit also used the site during this period. During this time it was known as "Mt Druitt" rather than the later locality name of Whalan. I am currently unsure what other features may be "leftovers" from the RAAF use. Other dispersal fields included hangars, admin buildings and aircraft "hides" but whilst presumed to have existed, at least to some degree and in some form, size and location are not specifically mentioned at Whalan/Mt Druitt in any documentation I have found. Like the other satellite or dispersal strips around Sydney the land was gradually re-purposed post-war. Between 1948 and 1958 the old (roughly north-south) airstrip was incorporated into what became the main straight of the Mount Druitt race track. 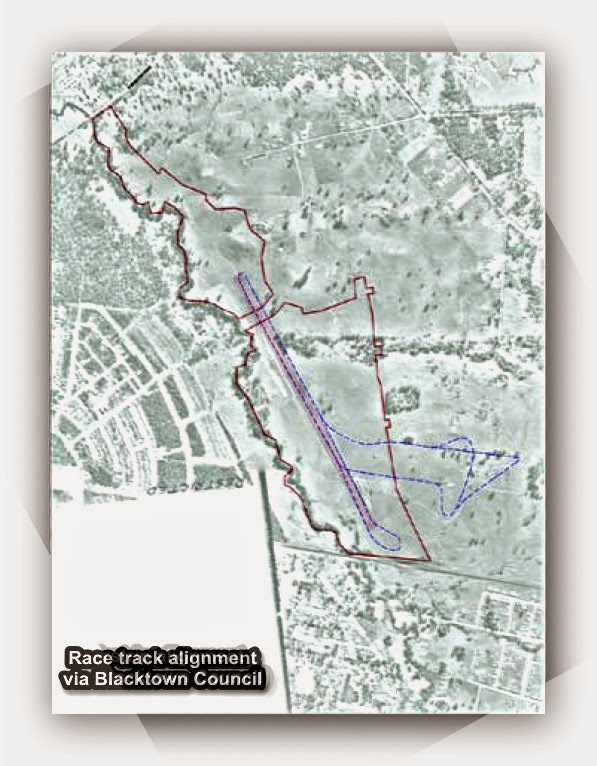 Initially it was a 1.5 mile (2.4km or possibly 2.9km by one source) out-and-back or "hot dog" style with tight 180 degree turn-arounds at each end but the full course, using a privately-owned paddock, was measured variously at 2.4miles (3.8km) or perhaps 3.6 kilometres long; it was situated on what is believed to be Whalan Reserve, possibly Tregear Reserve, part of the current Mount Druitt Industrial area and Madang Avenue Primary School. 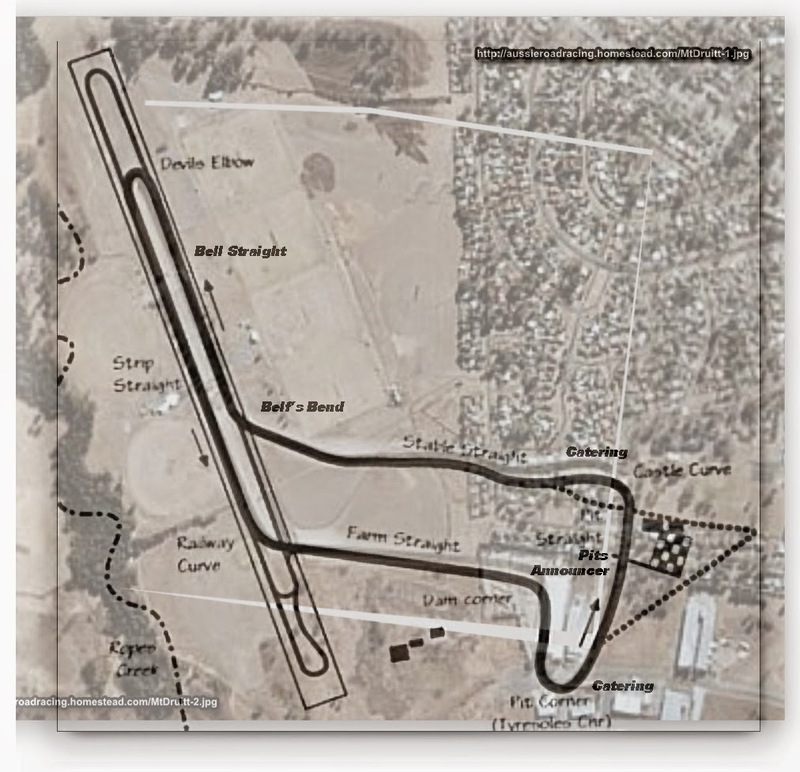 (Whilst the airstrip itself certainly extended into what is now Tregear Reserve I am uncertain that the race track used the full length of the airstrip.) The longer course was in use by 1952. The track was in any event closed in 1958 when a trench was cut roughly east-west by an excavator as a result of heated land ownership and management disputes, rendering the full length circuit unusable for racing. That trench is apparently still visible as a drainage ditch in parts. Now - and this could be a scaling issue - the maps I have seen so far offer up a question or 2: did the Mt Druitt race track use the full length of the airstrip, or just the southern section? Or did the track get shortened to the north before the digger went through to the south? The 1961 aerial shows the runway quite clearly and appears to show the race track looping back before the end of the strip (to my eyes, anyway). OTOH there was no need to allow for Debrincat Ave as it clearly didn't exist before the track ceased operation in 1958. Hopefully someone can fill me in on the answers here! 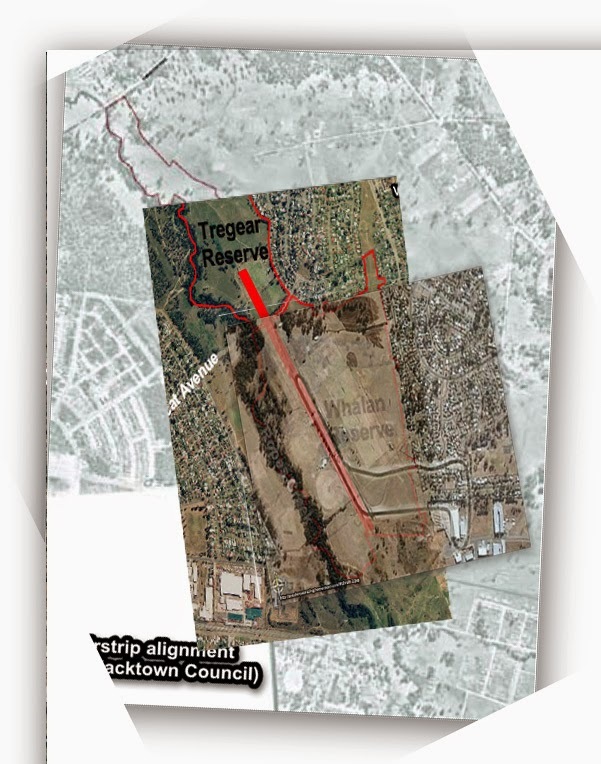 The map and aerial photograph above has been sourced from Blacktown City Council. Not only does it show a longer circuit using the full length of the airstrip to the north (crossing Debrincat Ave) and the later extension into the private (and higher) land to the east, it also shows the full length of the "hot dog" circuit, including a larger turning loop at the far southern end of the airstrip that extends well beyond both the width and length of the strip. This may be the definitive version, until someone who actually knows can confirm or deny. Option (b) is a race track cut short at the northern end, no longer crossing into Tregear Reserve. Maybe this actually happened? The shorter "full" track is shown on a number of images to be found on the Internet and it's unclear which is the original source. Perhaps there were 2 versions of the "full" circuit, or perhaps it's that scaling issue I mentioned! I did attempt to reconcile the scale by matching landmarks but am not convinced either way. In this image I have superimposed the shorter "full" circuit on the airfield site. Again credit to Blacktown City Council, Google Maps and Wikipedia for information and images that helped locate the track. Belfred Jones was by one account the first lessee, and by another account the man who dug a trench across the track to end the use of the full circuit; in any case, hence "Belf's Bend", I presume! 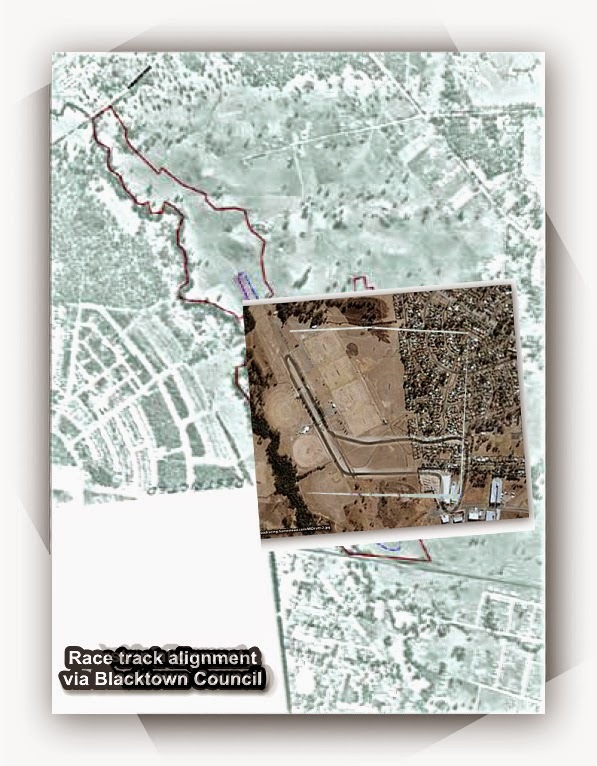 Interestingly there's also bitumen "bike track" at the southern end of the site that was (according to Blacktown City Council records) "originally utilised as a small race circuit". It looks substantial, if dilapidated now, apparently with banked corners! So, was it for pushbikes or motor bikes? The oldest sections are wider than strictly "necessary" for push bike racing (ie criteriums) and several people have mistakenly assumed that the cycle track is remnant motor race track; however there is considerable doubt over that. Whilst some sections do indeed seem to coincide others are clearly "new" and unrelated to previous use. 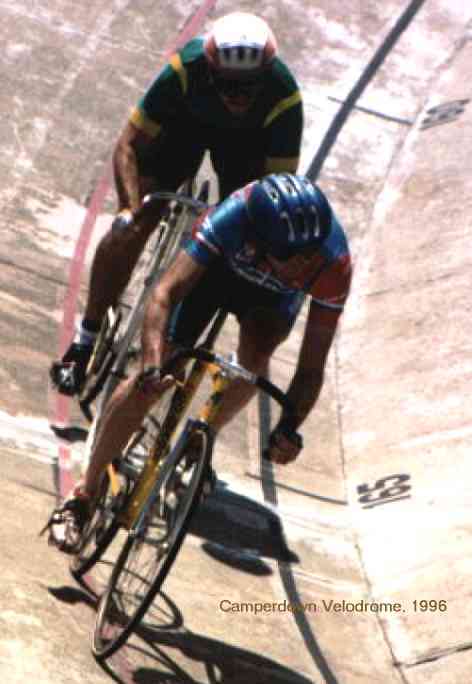 The narrowest sections of this cycling track do appear to follow the course of the previous motor race track but lie on top of previous use and in parts are offset to one side. In any case I have found no evidence (yet) of racing on that "new" circuit. It has been used for recreational cycling and is cut at 2 points by a newer shared pedestrian/cyclepath. Had it been used by pushbikes then it would have made a rather nice criterium track indeed... curious that it seemingly was not used or maintained. Lastly, wheeled racing continues on the site with a BMX track (official or not!) to the north-east and an "on road" RC model car racing group coincidentally and slightly ironically using one of the tennis courts (on the runway/strip straight alignment) as a purpose-built race circuit. Silhouet.com - a large database of tracks and maps. My list of Sydney's race tracks and circuits. or checkout my list of Sydney and surrounding airstrips and airports. The Doonside Model Aircraft Club still flys control line models on the old RAAF site most Saturday mornings. I spent a lot of time in Whalan reserve as a young boy in the early 1970s. You could still follow large sections of the motor racing track at that stage and I think I remember a small section in the Madang Primary School. I'm pretty sure the track did not utilise the Tregear Park section of the airstrip. My father used to take our home made go kart to the airstrip to let us drive around. The surface was small ball bearing type pebbles making it very slippery. I also remember wire and netting in the trees along the banks of Ropes Creek. As kids we assumed this was WWII camouflage netting. The newer track was built for bicycle racing and it does have a banked section. Thanks David, more good recollections! 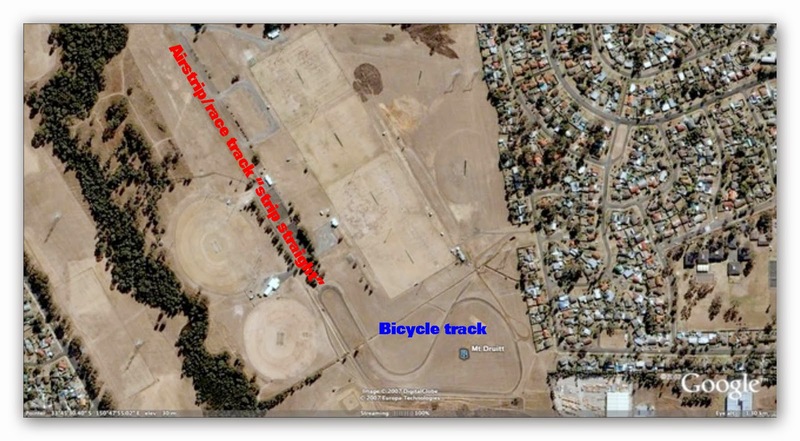 I'd love to know if anyone actually raced on that bicycle track, it looks pretty interesting with that banked section. They didn't seem to be using it in the '80s or early '90s, when I was racing, anyway. Shame. Cheers and thanks again, Rob. I grew up across from Whalan reserve (Mendi pl). I remember the bike track being built, and was first used for bicycle races, then later for go-carts.... hence the newer parts of the track and banks being widened. As David said, I also remember the netting and wires along Ropes creek, also there were a few concrete foundations that I guess were for buildings for either the airfield or racetrack. Thanks Peter for your recollections, that land has certainly had its share of uses! I used to spend plenty of time around and on the Airstrip, and exploring Ropes Creek, from 1968 onwards...I have no recollection of any netting and/or wires, nor any concrete foundations anywhere near the creek, or the treeline that surrounded it...some references to pebble sized stones on the surface of the Airstrip contradict my memories of what I thought was poor quality asphalt for the surface that was lifting and 'peeling' all over the length of the Airstrip, but still plenty of good memories of my time spent in the area.. I think the clue which can confirm the shape of the circuit in the residential area of Whalan is the location of a large two story house (almost a mansion) which was located on the eastern side of the track at or very close to the start and finish line. I have two photos, one looking at the house from across the track at the finish of a motorcycle race and another taken from beside the house at the start of a race. It can be seen that the track is very close to the house. 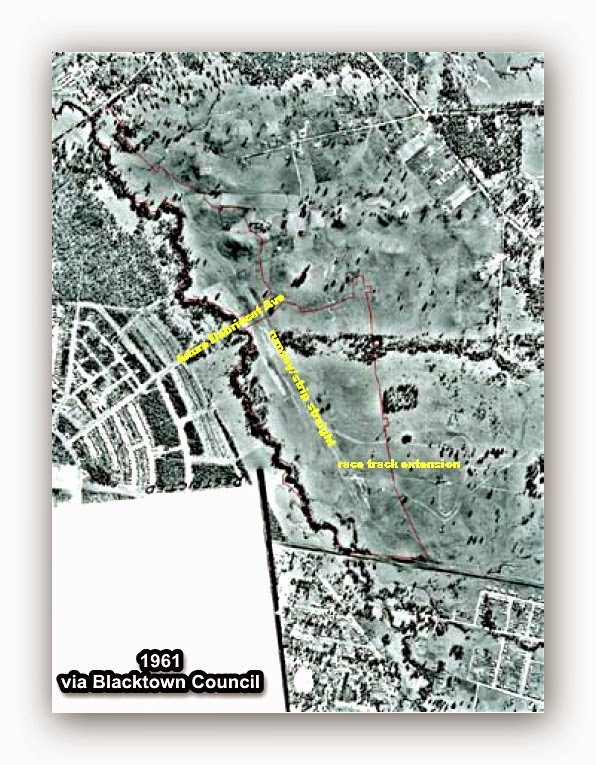 Using two lines, one from the intersection of Magnolia and Debrincat and the other at right angles to the railway line and using what looks like the house on the Blacktown City Council image places the house at the intersection of Madang and Mimika. Merely from memory I would have placed the house further along Mimika which might have been the highest point back in the 1950s. A look at the original image might identify the old house which would clearly define the location of the track at the start and finish. A third line related to the location of the old runway did not match an extrapolation of the straight shown on my old street directory. The two photos can be seen on the Mt Druitt Historical Website. That is me on the Triumph 500cc Tiger 100. Thanks for that Barry. That 2 storey house is very close to the track, isn't it!